We obtained a $9,500 settlement for Jacob Crawford, an investigative videojournalist and copwatcher, for his unlawful detention and citation by the Oakland Police on July 19, 2013. Oakland Police Chief Sean Whent had just instituted a policy of ticketing persons going to and from demonstrations for pedestrian and bicycle violations. Chief Whent and Mayor Quan claimed this ongoing policy was intended to deter vandalism and other serious unlawful activity, by openly gathering personal information on persons who attend protests, but the persons who have been ticketed are simply demonstrators and journalists, whose First Amendment activity is being chilled by the selective traffic enforcement. In Jacob’s case he was lawfully filming the police and asking their identities as a rally protesting George Zimmerman’s acquittal for killing Trayvon Martin was beginning, when Sgt. Darrin Downum detained Jacob and gave him a ticket for jaywalking. The ticket was completely unfounded and was thrown out in court. Jacob now works with Rachel full time as an investigator and paralegal. Read the Courthouse News article. We have a new, second office in downtown Oakland, near 19th St. BART. We are part of the newly formed Oakland Law Collaborative of five law firms providing social justice oriented legal services in multiple practice areas. Our main office is still in San Francisco in the National Lawyers Guild / San Francisco Tenants Union building on Capp Street. 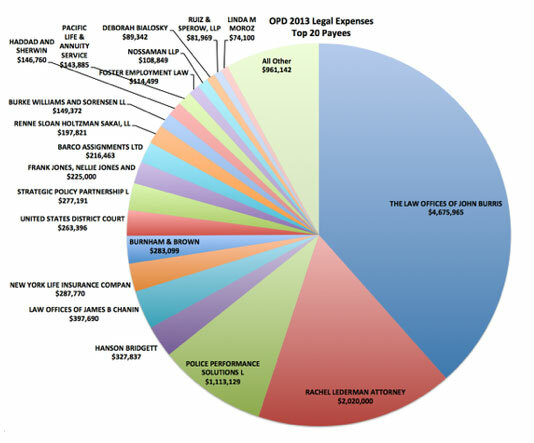 Top 20 legal expenses for the #Oakland Police Department, 2013. On September 16, 2014, we filed a claim on behalf of April Negrette and Kimball Bighorse, Native Americans who were kicked out of the SF Giants’ Native American Heritage Night for speaking out against cultural appropriation, and brutalized by SFPD. Rachel Lederman is representing two San Francisco City College students who were brutalized and wrongfully arrested by CCSF police and SFPD. Statewide rent control in Oregon! Please use our contact page or call for a free consultation. We cannot see you on a drop in basis.